Earn cashback as your spend! Simply use your card in any of the approved stores and receive up to 15% cashback rewards each month. Click here to see a list of the latest cashback approved stores. It's just like a normal bank account! You get a sort code & account number and can setup standing orders, bank transfers & direct debits. You can even pay your friends & family, make contactless payments and bank online. If you're worried about managing your money, or want to take the stress and hassle out of paying your rent, mortgage, utilities & phone bills, then look no further! 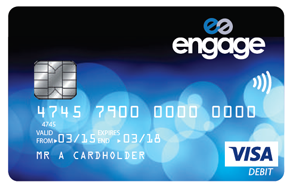 The Engage Account comes with a special feature that allows you to place money into virtual 'Envelopes' so you don’t accidentally spend the cash you need to pay essential bills. Using Engage 'Envelopes' online is easy! Simply click the 'Envelope' link on your Engage account, detail what money you have coming in and list all your bills going out. Specify who you need to pay, how much and when, then sit back and relax! Now when you get paid, your ‘disposable’ money is left in your account to spend as you wish, whilst the money required to pay your bills is set aside in virtual 'Envelopes' to be paid automatically when they're due. There's a small £2 monthly fee (automatically deducted each month). Other charges include a £0.75 ATM withdrawal fee, but withdrawing cashback at participating retailers is free! Click here for a full list of prices. The great think is there's no overdraft, so you can't go overdrawn, so there's no expensive interest charges. If a standing order payment fails, there's no charge! Simply contact Newport Credit Union to order your card and you'll have it setup within 10 days, it's that simple!